PREREQUISITES: Students have previously taken a 40-hr or 24-hr OSHA Hazardous Waste Worker course and have a valid unexpired certificate. TYPE OF TRAINING: This course is an interactive power point with audio and video. Students can come and go from the course as they need and will have 60 days to complete it. If you’ve already completed your initial OSHA HAZWOPER course at the start of your career working with hazardous materials, it may be that time for you to renew your HAZWOPER certification with our OSHA 8-hour HAZWOPER refresher course. Taking a refresher course won’t just jog your memory about important aspects of your job, it’s necessary to satisfy OSHA’s Annual HAZWOPER training mandates. If you let your HAZWOPER certification lapse, you may have to repeat your initial HAZWOPER training. Whether that’s a necessity will depend on various factors, such as your knowledge of the safety and health policies and procedures in place at your business, your specific state’s requirements, or if your supervisor requires this. To be on the safe side, you should complete a HAZWOPER refresher course as soon as possible if you didn’t do so by your anniversary date. DO YOU FIND TAKING TIME AWAY FROM WORK TO MEET THIS REQUIREMENT IS DIFFICULT? While it may sound easy enough to complete a HAZWOPER refresher course within the annual requirement, it isn’t always. Between the demands of work and your personal life, carving out time to sit in a classroom can be difficult, if not impossible, for many professionals. You can’t simply put your work or personal life on hold, after all. When you realize you’re in need of your annual HAZWOPER Refresher course and that it’ll be impossible for you to complete your refresher training in a traditional classroom environment on time, you may find yourself wishing you could complete your OSHA HAZWOPER refresher online. There’s no reason to wish, however, because Hazmat School provides 8-hour HAZWOPER refresher training online. Because you can take our 8-hour HAZWOPER refresher online, you can start your coursework any time you want. You don’t need to complete your training course in one sitting. Instead, you can come and go as you please. Once you’ve gone through all the material, you’ll take a final exam. If you pass the final exam, you’ll receive your certification in an instantly accessible PDF file. Are you tired of the same old OSHA Hazardous Waste Operations and Emergency Response (HAZWOPER) Annual Refresher training material rehashed over and over again? If so, this online course is for you! Our online, 8 hour OSHA HAZWOPER Refresher self-paced training course is full of interactive exercises and activities to help you meet the OSHA HAZWOPER training requirement. All of the information delivered in a straightforward manner with the flexibility to take it as your schedule permits is at your fingertips. Receive an OSHA 8 Hour HAZWOPER Annual Refresher certificate as soon as you finish the course. HAZWOPER training is required in any industry in which employees work with hazardous materials or are involved in the clean-up of hazardous materials or waste. The goal of HAZWOPER training is to instruct employees about how they should protect themselves and their immediate environment in instances when hazardous materials are released. 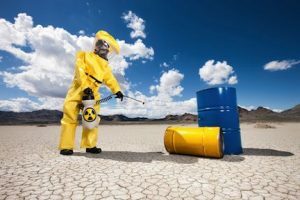 While it’s self-evident that verticals like the petroleum and chemical waste industries require HAZWOPER training, other industries that mandate this type of training may not be as obvious. Although it may be hard to believe, some of the products that are used to make art are considered hazmat, such as used paint. The construction, automotive, HVAC, medical supply, plastics and pest control product industries are more examples of verticals that may require HAZWOPER training. If you and your employees need to take a HAZWOPER refresher course and you want to complete your training at your convenience, set up a corporate or group account with Hazmat School. Depending on the number of people from your organization who sign up to take this 8-hour HAZWOPER refresher online, you may get a discount of between 10 and 20 percent for your group. Discounts are also available to government employees on both individual and group bases. To learn more about this online HAZWOPER refresher course and see if you qualify for any available discounts on our already affordable prices, contact Hazmat School today. This program meets the competencies outlined in the OSHA HAZWOPER regulation. Meet the requirements for certification of 29 CFR, Part 1910.120 or other applicable state regulations for certification in hazardous materials/waste worker. Understand the various training regulations relating to hazardous materials handling and response. Demonstrate an understanding of the terminology used in describing hazardous materials including vapor pressure, vapor density, specific gravity, miscibility/solubility, carcinogen, teratogen, mutagen, pH, PPM, etiologic, TLV, IDLH, flammable/explosive range, combustible, flammable, flash point, and ignition temperature. Demonstrate an ability to identify the hazards of various hazardous materials using the Department of Transportation (DOT) Labeling system, National Fire Protection Association (NFPA) 704 system, Hazardous Materials Information System (HMIS), and Material Safety Data Sheets (MSDS). Demonstrate an understanding of the need for respiratory equipment. Demonstrate an understanding of the advantages and disadvantages to the types of respiratory equipment. Understand emergency activities related to hazardous materials releases and of their role in the event of an emergency.